A lift kit is an aftermarket kit that raises a vehicle’s ride height. Its primary purpose is usually to allow the vehicle to clear large objects and travel over rough terrain more easily. Lift kits are most common for trucks, SUVs and other off-road vehicles that benefit from an increased ride height. The installation of a truck lift kit also increases the vehicle’s center of gravity, which changes its driving behavior. Truck lift kits may generally be classified as body lifts and suspension lifts. A body lift only raises the vehicle’s body from its frame, which increases the vehicle’s height without altering its suspension. This lift kit doesn’t increase ground clearance, and is therefore not typically used by off-roaders. However, a body lift may allow the vehicle to use taller tires, since it does increase the wheel well height slightly. Body lifts are the least expensive type of lift kit, since the primary parts are simple blocks or spacers. They typically raise the body by one to three inches. However, these kits may also require the bumpers to be raised, depending on the specific vehicle. Additional modifications that may be required to accommodate a body lift include extending the gearshift through the vehicle’s floorboard. 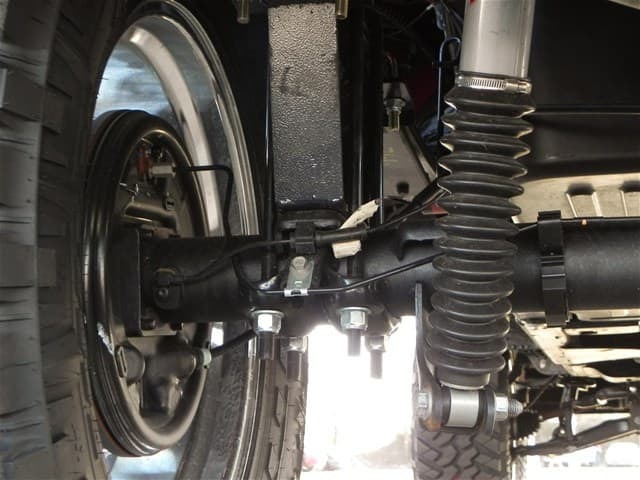 A suspension lift kit, also known as a leveling kit, increases the height of the vehicle’s suspension by replacing all of the shocks and leaf springs. High-end kits may also include control arms, customized four-link systems and trailing arms. Suspension lift kits also increase the vehicle’s ground clearance and allows the vehicle to accommodate significantly larger tires and wheels. Changes in the vehicle’s driving behavior include greater approach, breakover and departure angles. A good suspension lift kit can also improve the vehicle’s articulation, although this change may require steering stabilizers due to changes in the steering geometry. A suspension lift produces significantly better handling than a body lift, although it’s also more expensive. They typically increase the vehicle’s height by four to six inches, with 18 inches representing the maximum increase. However, these extreme lift kits are typically installed only on hobby or showcase vehicles, since they dramatically reduce the vehicle’s handling. All lift kits increase a vehicle’s center of gravity, which may require a driver to become familiar with the new handling characteristics. The most significant effect of this change is a loss of stability when making sharp turns, which typically occurs when avoiding an oncoming vehicle or debris. A lift of more than four inches typically produces a noticeable decrease in handling, and a driver must employ significantly greater caution when turning a vehicle with a lift of six inches or more. Lifted vehicles may also lean more in a banked turn, which is most common on an off-ramp or freeway interchange. Some owners install a lift kit for the purpose of placing larger tires on the vehicle. However, this increase in the tire’s circumference may also require the transmission’s gears to be replaced so that the vehicle can retain its original fuel economy and driving characteristics. The need for re-gearing depends primarily on the specific vehicle and the increase in the tire’s size. A professional mechanic will typically need to make this decision. The price of a lift kit primarily depends on whether it’s a body lift or a suspension lift. The total price of the conversion will typically include the price of the new tires. The raised vehicle doesn’t necessarily need tires, although the higher wheel wells will make the stock tires appear unusually small. A vehicle owner with good automotive repair skills and the right tools may be able to install a lift kit. However, most owners will want a professional mechanic to perform this modification. Look for shops that specialize in 4x4s to ensure they have the required auto bays and mechanics. Vehicle manufacturers in the United States can’t void their warranties when the owner installs an aftermarket part such as a lift kit. However, manufacturers often deny claims on vehicles with lift kits. It’s therefore important to determine the effect that a lift kit will have on warranty claims before installing it.